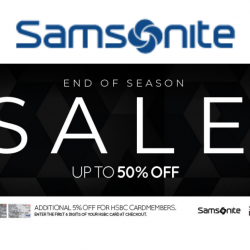 Enjoy up to 50% off selected products at Samsonite’s End of Season Sale from 1 Nov to 5 Dec! HSBC cardmembers also enjoy an additional 5% off, only at retail stores (excluding airport stores) and their official website. T&Cs apply. 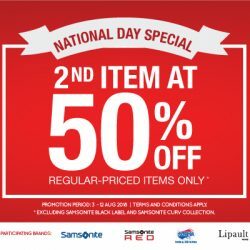 Celebrate Singapore’s 53rd Birthday with 2nd item at 50% off at Samsonite! Promotion is valid from 3 to 12 August 2018. T&Cs apply. 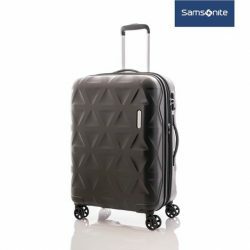 Till 31 Jul 2018 Samsonite: Great Singapore Sale with Up to 50% OFF Selected Luggage, Backpacks, Travel Accessories & More! 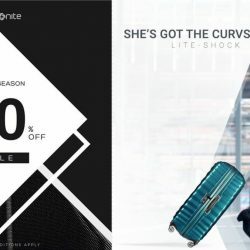 Don’t miss the Great Singapore Sale at Samsonite Singapore Factory Outlet #02-26, retail stores (excluding airport stores) and Samsonite's official website! UOB cardmembers also enjoy an additional 5% off (excluding factory outlet). Start your shopping spree for Samsonite, Samsonite RED, American Tourister and Lipault Paris, and get up to 50% off selected luggage, backpacks, ladies bags and travel accessories! Promotion is valid from 22 June to 31 July. T&Cs apply. 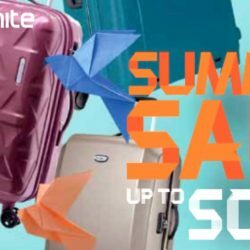 Samsonite's annual Summer Sale has started! Happening from 15 May to 21 June, enjoy up to 50% off selected Samsonite luggage and bags. 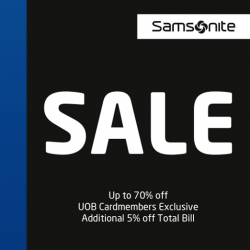 UOB cardmembers also enjoy an additional 5% off, only at retail stores (excluding airport stores) and their official website at rebrand.ly/summersale-samsonite! 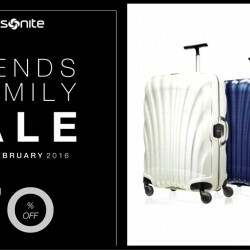 While stocks last Samsonite: Trade-in your luggage and get up to 40% OFF Selected Models! 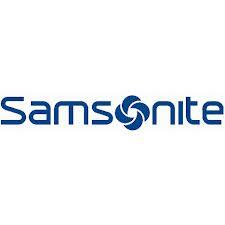 Samsonite's annual luggage trade-in is back! This time, in support of the global children’s charity, Make-A-Wish Foundation. 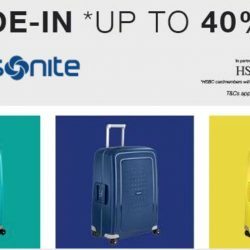 Trade-in your luggage in any size or condition and get up to 40% off on S'Cure and Octolite models. With every trade-in purchase, Samsonite will donate $10 and the pre-loved luggage in working condition to the Make-A-Wish Foundation. Promotion runs while stocks last. After trade-in, the S'Cure collection will be from $339 onwards and the Octolite collection will be from $266 onwards. Enjoy an additional 5% off if you charge the purchase to your HSBC credit card! Planning your year-end trip? 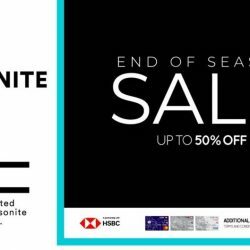 Get your travel essentials at up to 50% off with Samsonite’s End of Season Sale while stocks last! T&Cs apply. 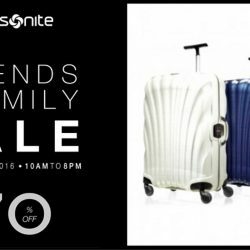 Don't miss the Samsonite Friends and Family sale happening from 25 to 28 July 2016. 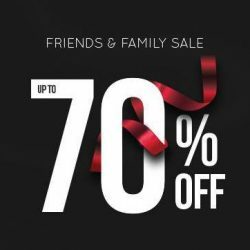 Get up to 70% off, and save more when you pay with your DBS card. 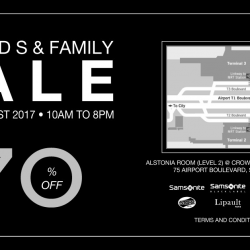 Great Singapore Sale happening at Samsonite Singapore! Enjoy up to 50% off on selected items from various brands! Promotion ends 31 July 2016. Terms & conditions apply, please check in-store for more details. 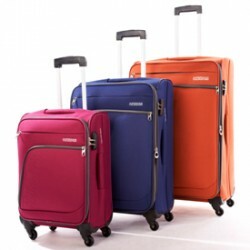 Samsonite is located at #02-281, Marina Square. 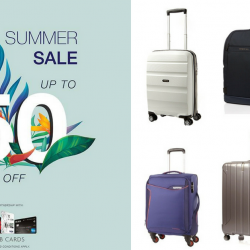 Grab this chance to get a high quality luggage from Samsonite at their Summer Sale with up to 50% off! Participating brands include Samsonite, Samsonite Red, American Tourister and Lipault. While stocks last! Looking for a new good quality luggage bag? Head to Samsonite's Friends & Family Sale now at TripleOne Somerset and enjoy up to 70% off their selection of good quality luggage bags, backpacks and other travel items! From now till 27 February 2016. 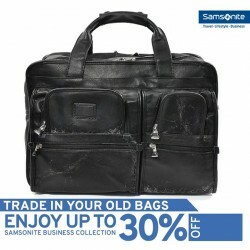 Receive 30% off your new Samsonite business bag when you trade in your old bags. Plus, get the Brit range at $50 with purchase of any items from our Business range! Terms and Conditions apply, check in-store for details. If you are a frequent traveller, be sure to get a good quality luggage bag that lasts through all the rough handling during your trips. The weight of the luggage bag should be as light as possible, so save you the excess baggage charges on each trip. Samsonite, known for their unique, durable and lightweight luggage, is having an exclusive private sale from today till 1st August 2015. If you are looking for a luggage bag for your upcoming travels, be sure to visit them at 111 Somerset Road, TripleOne Somerset #02-10 Singapore 238164, from 10am to 8pm. Check out their website to see which luggage suits you, be it hard case, soft or their stylish Red collection, you will find one that you like! Out with the Old. In with the New. 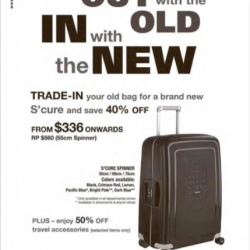 Samsonite offers Trade-in Deals in your old bag for a brand new S’cure and save 40% off from $336 onwards RP $560 (55cm Spinner). Plus – enjoy 50% off travel accessories. 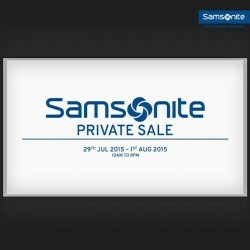 Exclusive offers at Samsonite private sale! Get additional 5% off with min. spend of $500 with Citibank Debit & Credit Cards. Samsonite Out with the in with old the new trade-in your old bag for a brand new ‘cure and save40% off from $336 onwards: RP $560 (55cm Spinner). Plus enjoy 50% off travel accessories. Samsonite (American Tourister) Fair is on from 20-26 October 2014 at Changi City Point! Enjoy up to 30% OFF selected items and get to purchase the American Tourister Glider Spinner, 55cm at $120, 66cm at $130 and 77cm at $140. Trade-in any used* business bags / backpacks for a new Samsonite business bag at 30% off. All old bag in usable condition will be donated to The Salvation Army. 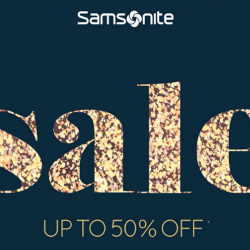 The fabulous Samsonite Sale is back with up to 70% off storewide! And get an additional 5% off your total bill. Exclusively for UOB Cardmembers. 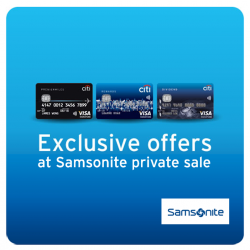 SAMSONITE PRIVATE SALE EVENT TOMORROW (31 Jul), exclusively for Citibank Cardmembers. Up to 20% off in-store items, for 1 day only!